Have you ever been completely fascinated by something? When I was younger I used to write letters all the time and seal them with wax seals, because I thought they were neat. They always reminded me of some Royal Kingdom far, far away. To this day, they still do. I picture ladies in a billowy dressing writing letters and sealing them with their family crests; Lords & Kings making mighty decrees for a whole nation of people on large scrolls, sealed with a symbol of their power in dark red wax. To this day, I still think of that. As I was meandering the internet several weeks ago, I came upon a lovely scrapbooking blog on how to make your own wax seals using Zots adhesive dots. As soon as I saw them I was taken back to my childhood and my fascination with wax seals. Several months ago I reached out to several of my Parker collectors. One of the most frequent comments from them is that there is too much “paperwork” with my StoryBook Scenes. As one of my collectors put it: “I’m not interesting in the adoption certificate, just the figurine.” Even though my Parker & Lolly characters already come in custom muslin bags, I wanted there to be just that one more thing that makes them special & completely my creation. Then it hit me, faux wax seals on their collectible bags. So … without any further ado, let’s get started! Remember that you can use regular polymer clay to make a mold of something. You do not have to use mold putty or silicone. 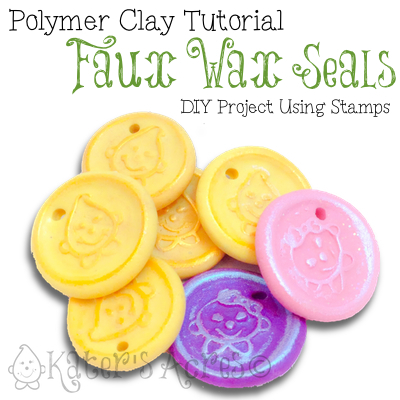 In this case, your “mold” to make your future seals, must be made from firm polymer clay. To give your wax seal suability, use a clay with strength to make your mold, my preference is Premo! polymer clay. Can’t you just make a flat round and press a stamp into it? Yes, but it won’t have the natural characteristic of a raised wax seal. But this tutorial will show you how to remedy that. The first thing you need to do is decide what you want to make yourself a wax seal impression of. Because I had a specific purpose for my seals, I used my characters, Parker & Lolly. Choose any accent stamp that you have in your collection as any stamp can be made into a seal. NOTE: Keep in mind that if you stamps have words, after you cast your mold, your words will be backward, please choose stamps without words for this reason. NOTE: Because this mold needs to be strong, unless your “scrap stash” contains mostly Premo! or Fimo Classic clays I would use fresh clay for your molds. It will also be easier to see the impression to know if you’ve made a mistake or not. Use enough clay to contain your entire stamped image. Using a piece of glass or an acrylic block, flatten it into a round about 1/4″ thick. Spritz your stamp lightly with water to prevent it from sticking to the clay. Place your stamp in the center of the flattened round. Use the acrylic block flatten the stamp into the clay. NOTE: If you don’t like the impression that was left behind, try it again. Remember that nothing is permanent until it is baked. Bake your round in the oven for approximately 45-60 minutes at 275 degrees Fahrenheit. Roll a ball of fresh clay. Press mold you made above directly on top of the ball to flatten it. Clay will spill out over the edges of the mold, just like a real wax seal. NOTE: To make your seals “pop,” dust your finger with mica powder and gently rub over the raised portions of clay. NOTE: I added holes to my seals so that they could be threaded and hung off my muslin bags, you would not add a hole in yours if you are going to use it as a traditional wax seal. Branding your custom items (like me)! Attach to the back of invitations for parties or weddings using scrapbook glue dots. Use an initial stamp and make a seal for your handmade Christmas gifts you give to family & friends. Use them for wine bottle decorations.